(C) Geomancy.net 2018 : "The Oldest Feng Shui Forum in the WWW - Can be authenticated via waybackmachine.com"
1.1. Frontage of this home: For flats usually standing inside the living room looking outwards. 1.2. #1 represents the coming prosperity (2044 to 2063) Water wealth star. 1.4. As #1 is the Water star, good that this home (if a condo or EC) has the advantage of facing REAL water. 1.5. If frontage has no real water, perhaps consider a water feature especially (it there is a balcony) for this home. 2.1. Where is the Current Prosperity Wealth Luck for such a home? 2.2. Often for majority of most homes: if the facing direction of a home is North, most likely the kitchen or the service yard is at South sector. 2.3 If so, the double auspicious #9’s representing current prosperity are wasted at the “rear” of the home. 3. N1 vs S1 Flying Star chart: In general S1 is better! 3.1. Thus one consideration especially for an East Group person (North, South, East or SE) is to consider a S1 facing instead of a N1 unit. On the assumption that this development has a choice of between a N1 or S1 facing stacks/units. 3.2. 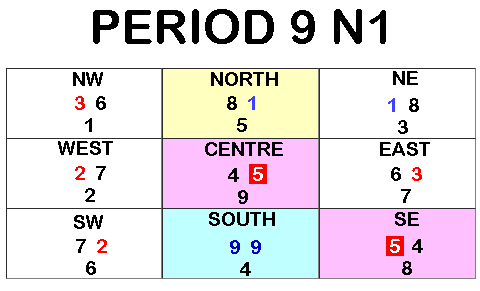 Please note that do not always choose S1 as there are also other facings with favourable luck. 3.3. Why choose S1 vs N1? For a S1 facing, often the good thing is that the double auspicious #9’s is often now at the frontage and not wasted at the rear of the unit. However, for an S1 usually in many cases the kitchen may either be at NE or NW sector. 3.4. The main caution for a S1 facing is: if possible to avoid a kitchen at NW = inauspicious Fire at Heaven's gate. 4.1. As the centre has a #5 = misfortune / sickness: it is good if this is "locked" up. 4.2. Here, it is good that the centre has a store-room or narrow confines of the corridor leading towards the bedrooms or just outside the common toilet. It is still not ideal for the centre to have a stove, sink or WC. 4.3. Thus if possible avoid a home with open space at the centre area. 4.4. Traditionally, some practitioners recommend hanging a wind-chime, here. Frankly, this is not necessary if Para 3.2. above is met. 5.1. Favourable if a bedroom or bedrooms are located in this sector. As there is an auspicious coming prosperity Mountain Star #1 in this sector. 5.2. Often, for this facing: either the living room or master bedroom is at NE or NW sector. Both sectors favour a West Group Person. 6.1. Mountain Star #9 = misfortune/sickness is at SE. Thus, it would be nice that this is not a bedroom. Although a study (not perfect) is better than a bedroom, here. Good if this is the Master Toilet or often a missing corner or Air-con ledge.